This image shows two views of the trailing hemisphere of Jupiter's ice-covered satellite, Europa. The left image shows the approximate natural color appearance of Europa. The image on the right is a false-color composite version combining violet, green and infrared images to enhance color differences in the predominantly water-ice crust of Europa. NASA is asking the scientific community to help it devise a relatively low-budget mission to Jupiter's moon Europa, perhaps the solar system's best bet to host alien life. 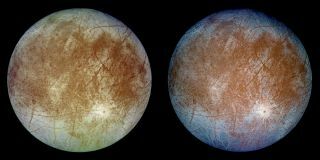 The space agency announced Monday (April 28) that it has issued a Request for Information (RFI), officially seeking ideas from outside researchers for a mission to study Europa and its subsurface ocean for less than $1 billion (excluding the launch vehicle). "Europa is one of the most interesting sites in our solar system in the search for life beyond Earth," Grunsfeld added. "The drive to explore Europa has stimulated not only scientific interest but also the ingenuity of engineers and scientists with innovative concepts." The deadline to submit ideas under the RFI is May 30, officials said. At 1,900 miles (3,100 kilometers) wide, Europa is only slightly smaller than Earth's moon. The Jovian satellite harbors a large ocean of liquid water beneath its icy shell, providing a potential habitat for life as we know it. Further, astronomers announced in December that they had detected a plume of water vapor erupting from Europa's south polar region, suggesting that a mission to the moon may be able to collect samples from the ocean without even touching down. But the space agency has gotten some money to help develop technologies needed for a Europa mission. Congress appropriated $80 million for this purpose last year, and the White House allocated $15 million more in its federal budget request for fiscal year 2015. NASA officials have said that they hope to launch a Europa mission in the mid-2020s. If that happens, the mission would follow closely on the heels of Europe's JUpiter ICy moons Explorer mission, or JUICE, which is currently scheduled to blast off in 2022 to study the Jovian satellites Callisto and Ganymede in addition to Europa.